We’ve been even busier than usual the past few months, revamping, building, and tweaking to make reminderband.com even better. Today we’re proud to announce the launch of our new site and even more excited to share it with you. Over the years, the creativity, passion, and drive of our customers has blown us away and fueled our resolve to improve the wristband creation process. We hope our new website will make designing and ordering even easier and take you and your causes to new heights. With our updated design, you can add artwork, choose from a variety of fonts and preview real-time what your band will look like when produced. We hope you’ll try it out and let us know what you think! Enjoy the new Reminderband now and look for more site updates in the coming weeks and months, including new products, ideas, and customizations. Reminderband, a well-known manufacturer of Silicone Wrist Bands, is just releasing its new Royal Blue wrist band for families of Sandy Hook School Shootings. Salt Lake City, UT – January 15, 2013 – Reminderband® Inc. is proud to announce the release of its all new custom wristband that remembers the victims of the Sandy Hook School tragedy. The popular manufacturer of silicone wrist bands is now offering them on its website for sale as low as twenty-eight cents each. They can be used to show support for the families of victims and also as a means of raising money to support this worthy cause. A number of individuals and companies are coming together to find unique ways to raise money for the students and families of Newtown, CT where the horrific tragedy that rocked America took place just before Christmas. The nation still mourns the loss of the students and teachers who died there and Americans from every walk of life have been united in numerous endeavors such as gun control and raising awareness for the mentally ill.
Reminderband is often referred to as the, “Original Wristband” company and their reputation is widely known. They manufacture top quality 100% silicone wrist bands that come in 24 stock colors. Unlike other companies, Reminderband will allow customers to order any number of wristbands from one to thousands.Their standard wristband can be personalized in many ways including beautiful colors and catchy slogans. These custom bands are used in many organizations to raise awareness, as well as donations for causes like breast cancer, animal rescue, global warming, and homelessness. Reminderbands are often worn for years and are the strongest wristband on the market today.They can be ordered in a number of styles such as tire band, marbleized band, multi-color band, and golf band. You can place just about any message on a Reminderband and they feature deep embossing that can be filled with a second color for a small additional charge. The Reminderbanddesign chosen for the Sandy Hook victims is royal blue and comes in the shape of a heart. It is embossed with the words, “Sandy Hook in our Hearts”. It can be purchased in any quantity on the website for as low as $.28 cents per wristband, making it a very cost effective way to raise money for your organization. 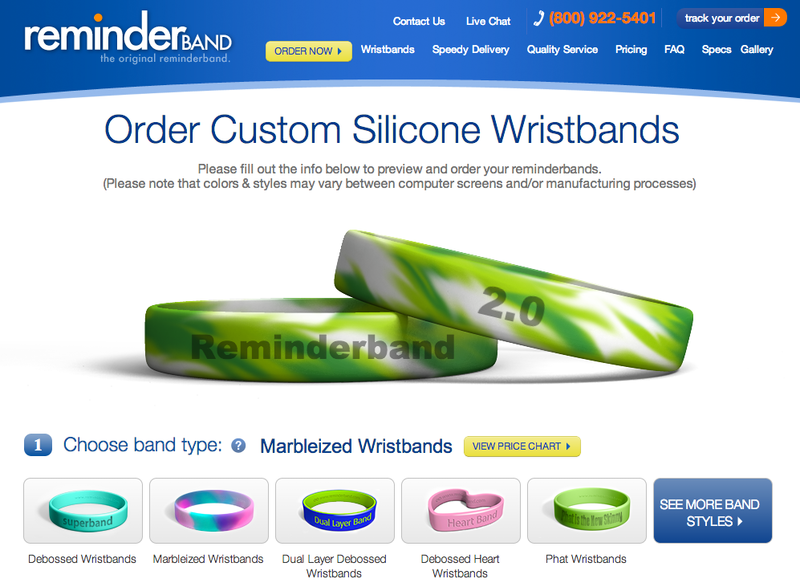 Reminderband is one of the oldest and best known manufacturers of 100% silicone wrist bands. They offer 24 stock colors with embossing at very low prices. Wrist bands are completely customizable and Reminderband can even ship your order within 24 hours if you are in a rush. The high quality wrist bands can be ordered by the hundreds or thousands or you can order just one. They are a great way to share your enthusiasm about your favorite sport, team, charity or hobby. Ben’s cancer is now in remission, thanks to his determination to beat this disease and with the help of his family, friends and doctors for their support in helping him raise money for cancer research. Ben is now a 19 year old freshman attending UC Irvine. How do you repay the many men and women who fight for our freedom every day? They sacrifice so much in order for us to have the freedom and liberty that we all enjoy. Reminderband Inc had the opportunity of making silicone wristbands in honor of Sergeant Merlin German. Merlin was born in Manhattan, New York on Nov 15th, 1985. On January 21st, 2005, Sergeant German’s squad was on a mission enroute from Jordan to Baghdad, when he saw an IED while standing in the turret. His humvee was hit by a gas-fed charge explosive and Sergeant German was burned over 97% of his body. He had endured about 100 surgeries and much pain before he died on April 11th 2008. His courage and great attitude will be missed by all who knew him. He fought his personal battle for nearly three years, but died while recovering from his last surgery. I wanted to contact you to let you know how awesome Test Me I’m Clean is doing! So far we have sent out Reminderbands to 11 different countries Including the U.S., 17 different states and 26 different U.S. cities!!!!!!! I also just wanted to let you know that the Olympic trials are being held in Eugene Oregon on June 27th through July 6th! I will be handing out Reminderbands like crazy!!!!! Please Let everyone know that I will be racing to make the Olympic team and My Test Me I’m Clean wristband will be right there with me every step of the way!I cannot thank you enough for all the work you did to help support my organization and me as well! I really appreciate it so much and I just wanted to keep you updated on how your Olympic hopeful athlete is doing! Striped silicone bracelets have just been released from Reminderband. (PRWeb) March 22, 2007 — Reminderband has just released their “striped bands”, making a statement in blue, red and black. The wristbands add a touch of distinction and mastery to the bracelet, allowing it to stand out with boldness. The striped bands are available in two stripes – one white stripe and one color stripe, or in three stripes – with color on the outsides of the bracelets and a white stripe in the middle. As always the bands are available in multiples of 20 with no extra charges for phrases debossed onto the bracelet or for artwork added. Color fill (where the words are printed in a chosen color) is the same additional price of .25 cents per band. Moved by the rising death toll and the violence in Sudan, Mal Sirrah designer Malcolm Harris and model Lydia Hearst-Shaw organized a fundraiser for Darfur as the Fashion Week finale. Models, who worked for free, hit the runway in clothing and accessories donated by more than 70 designers. Shoe-maker Steve Madden provided shoes, bags and clothes. Aveda provided hair and makeup. So, how is this a fundraiser? Clothing and accessories featured in the show are being auctioned on eBay (www.ebay.com) to benefit the Save Darfur Coalition. All of the profits are going to the coalition. The auction ends Thursday. Designers used four colors, those often associated with Africa: red, yellow, green and black. Among those contributing were Michael Kors, Donna Karan, Carmen Marc Valvo, Chado Ralph Rucci, Tracy Reese, Catherine Malandrino, Costume National, Heatherette, L.A.M.B., Rachel Roy and Nanette Lepore. But still, I applaud Harris, Hearst (daughter of Patty), Madden, Aveda and all those involved. Like George Clooney and Oprah Winfrey, they’re using their power and influence to shine a light on a very dark corner of our world. A friend asked if I really thought buying a designer dress would make a difference in Darfur? A dress, a T-shirt, a necklace, a pin, a scarf can send a signal of awareness. If the message isn’t clear or universal, hopefully and ideally, the wearer can explain the crisis or the cause. Back in the office, during a meeting Tuesday morning, I noticed that a male co-worker was wearing a yellow “Live Strong” rubber bracelet. Since 2004, millions of those awareness bracelets have been sold at $1 to benefit Lance Armstrong’s foundation for cancer research. That’s just one example of many. The fashion industry as a whole has raised millions for the fight against AIDS/HIV, to help the 9-11 recovery, to benefit tsunami relief and to aid Hurricane Katrina survivors. The money from DesignersForDarfur goes to a coalition leading the effort to help end the violence (www.savedarfur.org). Since 2003, more than 400,000 Sudanese have died. More than 5 million people in the Sudan have been displaced and are struggling to survive. If a dress or a wristband helps even one person — or inspires someone to come up with a workable solution, it’s worth it. Bright yellow and black Reminderband wristbands are worn by the “Extreme Makeover: Home Edition” construction team members and community volunteers while they busily prepare the home and yard for this morning’s demolition of the Pauni home. The volunteer wristbands are bright yellow and have the “Extreme Makeover: Home Edition” logo emblazed in black. The customized silicone wristbands will be given to volunteers beginning Tuesday morning as volunteers sign in at the check-in tent and to many of the catering crews and members of the security staff. Utah State University student volunteers on campus are also accepting one dollar donations for the bracelets and all proceeds will benefit the Pauni family. Based in Logan, Utah, Reminderband Inc. is an innovator and industry leader in the production and distribution of customized silicone wristbands. Launched in 2004, Reminderband took the Lance Armstrong “Live Strong” bracelet craze and developed the silicone wristband concept into a sustainable fashion, fundraising and awareness medium. Reminderband has developed a quick mold system that can produce, customize and ship as few as 20 silicone wristbands in less than six days. Reminderband also provided the “Push it for Ben” and “Support Ben” wristbands used by the Logan area Sky View High School football team. The team has dedicated its season to Ben Lyman, a former team member who passed away this summer in an accidental drowning. The team is currently undefeated and will win the Region 5 title if it defeats Mountain Crest High School this Thursday, October 19 at Sky View High School in Smithfield, Utah.